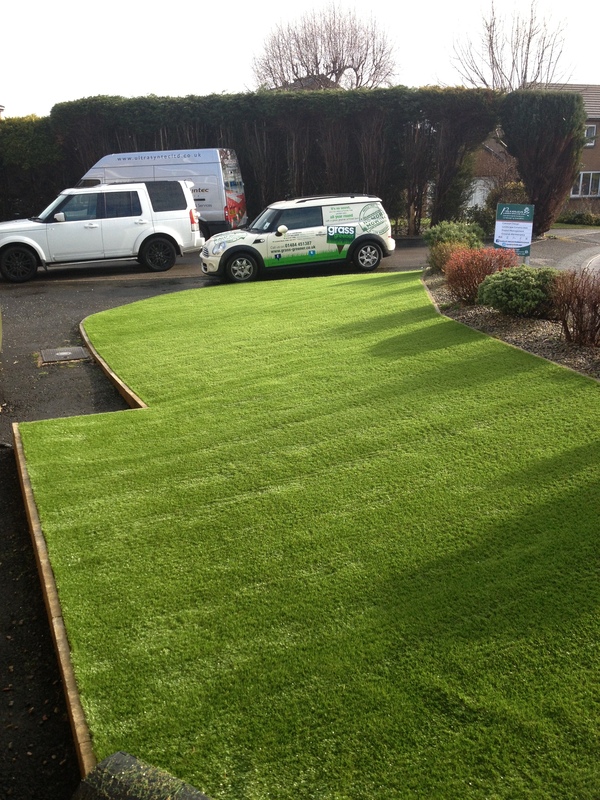 “Pay cheap, pay twice” is a phrase that rings true in many walks of life, but is particularly close to home as Justin Paxman of Paxman Landscapes installs new Grass Greener artificial turf to replace a failing inferior artificial turf installation in Huddersfield. Not only has the original lawn been down less than a year, it is barely suitable for the heavy rigours of a domestic lawn. 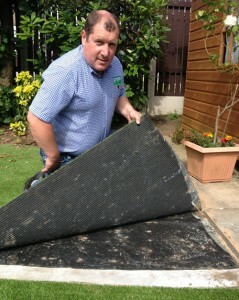 The installation method and materials used have rendered the garden unsafe and unsuitable for purpose. 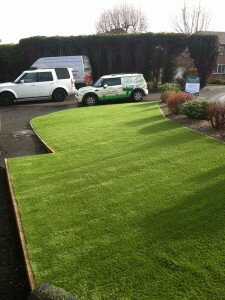 What is more, this practice of “making do” is undermining the reputation and advantages of quality artificial grass such as Grass Greener and the name of professional landscapers and installers such as Paxman Landscapes. 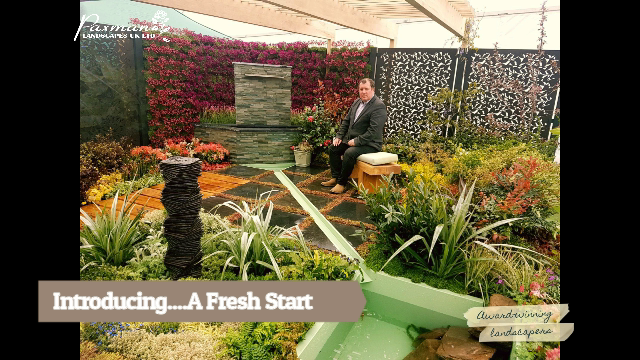 Justin launched the Grass Greener range of artificial lawn products at the Harrogate Autumn show in 2013. The products provide low-maintenance, pet-friendly garden solutions for domestic lawns and commercial premises who want that instant “wow” factor as well as lush lawn longevity. All of the Grass Greener products benefit from heavy-duty Latex backing, high quality stitching and density and a balanced mix of polyethylene, polypropylene or polyamide, depending on the chosen product. All of these elements are essential for a long lawn life. Repairing this existing artificial lawn highlights just how things can go wrong if shortcuts are taken or if materials are compromised to reduce costs. The lawn edges and joins are lifting as the wrong adhesive has been used and with a lifting lawn comes moisture seepage, a trip hazard and a shoddy end product. 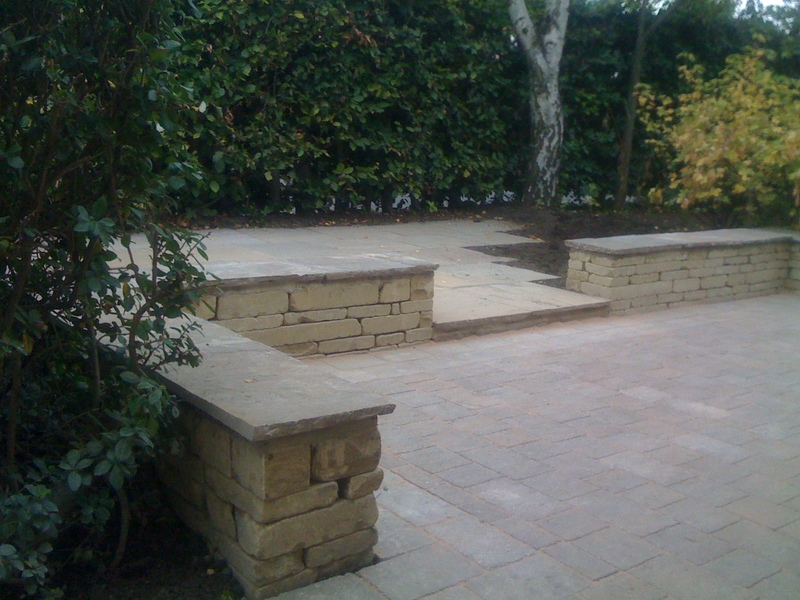 A Grass Greener installation starts from the initial site consultation, taking into full consideration any soil level changes, edging and slopes. In this case, the ground was not correctly prepared, leaving trip hazards onto existing hard surfaces. On some edges, the company responsible for fitting the existing turf had run out of membrane, leaving the new artificial grass with no layer of protection. Add to that poorly dug-out soil with some Summer bulbs still growing through and it was both a sorry site and a poor advert for artificial grass. All Grass Greener installations use a specialised 2G double membrane process, which puts the product at the very top of the market for quality, resilience and longevity. These 2G membranes are installed in a specific way to ensure the product can be guaranteed for 10 years, once properly installed. The first layer protects the grass from mud, water and weeds and the second ensures that the artificial grass stays stable under use from pets and people alike. During installation, the addition of a failsafe, discreet plastic skirt runs around the edge of the grass and protects it from uplifting. Justin believes that the market should set some clear regulations as to the installation and product specification of artificial turf. He believes the introduction of a regulatory body would begin to stem the flow of inferior artificial turf materials and ensure professional standards of installation were set and adhered to. Justin is under no illusions – whilst it is perfectly possible that artificial lawns can be installed by any competent DIYer, a Grass Greener 10 year product guarantee and 6 year installation is not “pay less, pay twice” but “pay experts, pay once”.